I feel for Bohner et al. Much fun has been had with the sheer comic absurdity of the GOP “Budget” proposal announced with such fanfare today. As TPM notes at the prior link, Ezra Klein has perhaps the most fun it is possible to have with this one whilst fully clothed. I’m not going to do much more here than send you there, except to add this thought from within the main thematic preoccupation of this blog. One of the fundamental problems in the Washington faction of the GOP in particular, and what its adherants mislabel as American “conservatism” in general is the disdain not just for science as an enterprise, but scientific thinking as a way of making sense of such basic tasks, as, you know, counting stuff. The “budget” offered today as the GOP alternative contains, as Presidential Press Secretary Robert Gibbs noted, more pictures of windmills (1) than numbers (0) than did the Republican “budget” — as, in fact, does this sentence. The budget — no, I’m not going to call it that, for to do so is to be an accomplice after the fact of the brutalization of an innocent English word after the fashion that Orwell warned against…the document that the Republican congressional leadership presented today is one that believes in magic. It says, in effect, we’ll do some stuff (we’re not sure what) and good things will happen (where not sure exactly what here either, or when, or how much, but it will be good). I won’t belabor the point — this is one of those times when I think it is impossible to parody an event that was its own mock. Or perhaps rather, Stewart and Colbert will have their way with this, but I lack their gifts, and know better than to punch that far above my weight. But I will say that for all the difference in methods and approaches and even the cultures of different disciplines (and even different labs within the same or closely allied fields) the one thing you learn within weeks of diving into a serious scientific education is that for an idea to have meaning it has to be subject to tests of applicability that anyone — and not just the first one to think of whatever it is — can perform and interpret. Take for example, this story, just published in The American Scientist (and by one of the current students in the MIT Graduate Program in Science Writing, if I may toot a horn). There is an argument made here, with elements drawn from observation and from theory-based calculation. The reasoning is explicit, and there are real world consequences that can be assessed and incorporated into whatever comes next in the field under scrutiny (quantum computing, as it happens). And the point here is that this problem, this essential meaninglessness, does not seem to have occurred to any of the “leaders” presenting the GOP response to the Obama budget today. It didn’t bother anyone that they were bringing to the public a document that was not in fact a budget, a quantified policy proposal, something that could actually be understood and argued about. And that, I think is the real problem with the not-quite-sure-if-it’s-loyal opposition right now. If it can’t even make sense at the policy level — and even more if it can’t recognize that it is publicly and humiliatingly hawking nonsense — then they simply can’t be allowed close to sharp implements and heat sources. *Or at least one of these guys was the one presenting budgets to Congress. I do remember what happened in November 2006. 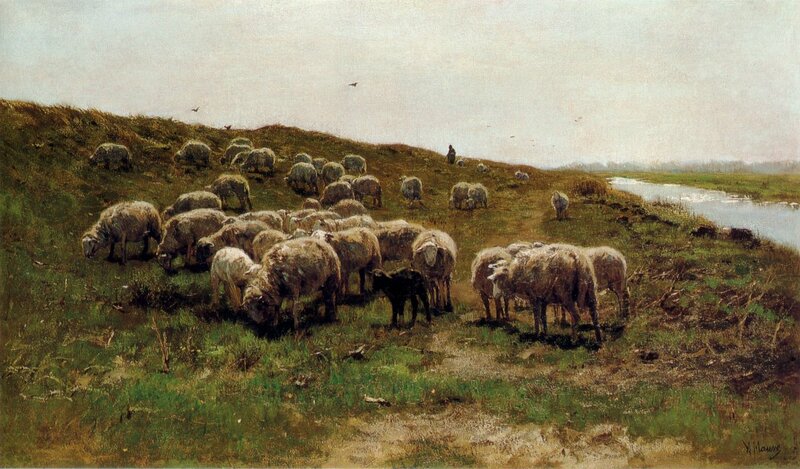 Image: Anton Mauve, “Sheep on a dyke” 19th c.
This entry was posted on March 26, 2009 at 9:25 pm and is filed under bad ideas, Economic follies, Policy, political follies, Politics, Republican follies, Republican knavery, ridicule, Stupidity. You can subscribe via RSS 2.0 feed to this post's comments. You can comment below, or link to this permanent URL from your own site. It’s so absurd it’s almost beyond my ability to parody. Almost. Hence my link.